If you missed last weekend with two plus feet of new snow, there’s a silver lining: more snow is coming this weekend. The weather forecast is for 1-2 feet, so make some plans now if you want to ski some powder. 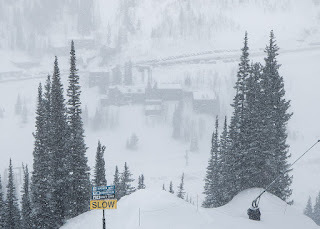 Alta’s base today is 84-inches which means there is really great coverage at Alta. 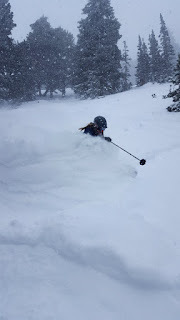 We were fortunate to have fresh snow on Monday morning with sunshine which brought in more than the usual crowd on a Monday morning–vacation, mental health and sick days were all in order. It’s another season of fun skiing at Alta and we’ve still got more than half the season left to go. We’ll have an update on what El Nino has in store for us next week…yes, next week is February already. Snowy Alta Lodge as viewed from near Nina’s Curve.